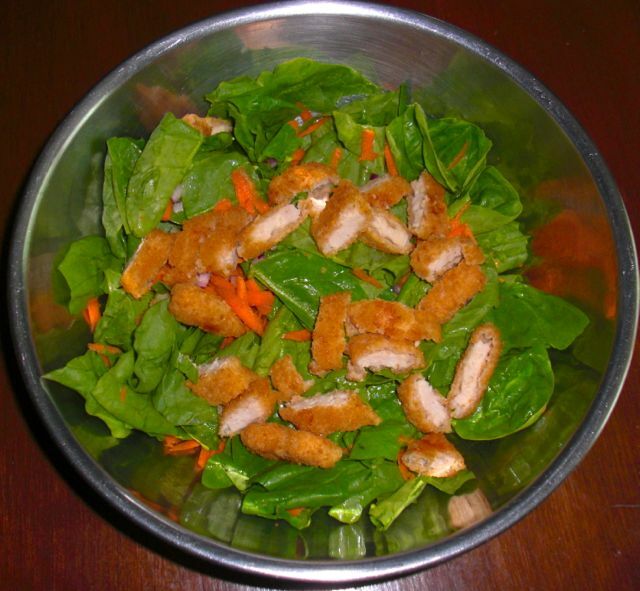 This easy but oh so tasty salad is topped with boxed chicken fingers that were cooked and chopped. This is my new favourite at home salad, which I covered in creamy poppy seed dressing to give it some extra yum. This salad is fresh spinach, grated carrot, chopped purple onion, and cucumbers. The best! Hey, I thought of you today when I picked up a big bag of corn from the local farmer down the road. I thought, man, I wish Jenn B lived closer. Also, I'm ready for pumpkin spice. Going to try your sweet potato trick this fall. For sure.